When was Budapest Parliament built? The building of a country’s law-making body is always a great symbol and pride of a nation. These buildings were built unique, magnificent and in a special style. Therefore, Budapest Parliament is rightly considered to be among the most wonderful parliament buildings in the world. It has also been added to the list of UNESCO World Heritage sites as a central element in the Danube panorama. The best view of the historical building is right on the opposite side of the river, however, best pictures are taken from the river. 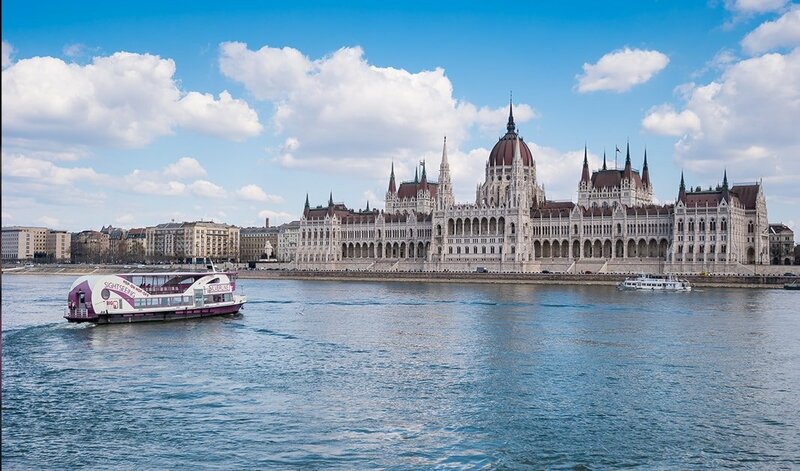 Companies with river cruises offer incredible sightseeing tours or dinner cruises on the daily bases to make it possible to adore the Parliament from the best spot. It provides a home for legislation, safekeeping the Hungarian Holy Crown, and a workplace for about 200 Members of Budapest Parliament and for circa 600 people assisting them. This impressive building was erected in the late nineteenth century (1885-1904). As a matter of fact, there was a truly dynamic economic growth in this era. Therefore, many famous buildings constructed at this time, like Heroes’ Square, Andrássy Road, and a number of bridges over the Danube as well as the opening of the first underground railway on the continent. During its construction the main purpose of builders was to use domestic materials and workforce meanwhile reflecting the vegetation of the Carpathian Basin in its ornamentation. The budget was unlimited, indeed, i.e. its decoration contains about 40 kilograms of 22-23-carat gold. A famous designer, Imre Steindl, designed the building in neo-gothic style, although its floor is Baroque and the ceiling shows stylistic elements of the Renaissance. Taking a glance from the side of the Danube, you can see the halls of the lower and upper houses on both sides of the dome which is surrounded by turrets. They, by the way, evoke the memory of the bicameral parliament which operated at that time of construction in Budapest history. The two halls are completely identical in size and shape expressing the equality between the historical upper house and representative lower house. The dome between them is the venue for joint sittings of the two chambers. The scale of the building is commanding. The wings running parallel to the Danube is 268 meters long, its width is at 123 meters. With these features it is longer than the Houses of Parliament in London. With its fabulous turret the dome leaps into the sky at a height of 96 meters. The façade is ornamented with 90 stone sculptures representing great figures from Hungarian history, and the red carpet running through the building is about 3 kilometers long. Seven hundred thousand visitors see the House of Hungarian Parliament annually; however, visits are restricted during weeks in which the National Assembly holds its plenary sittings. The Visitor Centre has longer opening hours from April to October from Monday to Sunday from 8 a.m. to 6 p.m., and shorter from November to April 8 a.m. – 4 p.m. Both individual and group tickets can be purchased. The admission fee is relatively cheap with great discounts for students and kids. Before entering the building you are required to read the dress code and code of conduct. The tour guides speak nine languages: Hungarian, English, French, Hebrew, German, Russian, Italian, Ukrainian and Spanish. Tickets can be booked in advance which makes the entry process easier and smooth-flowing. Guests of Members of Parliament may visit the chamber gallery on certain days. The tour departing from the Visitor Centre takes approximately 50 minutes; the main stops are the City Side Staircase XVII, the Chamber of Peers, the Lounge of the Chamber of Peers, the Dome Hall, and the Grand Stairway. All in all, this colossal edifice, having witnessed not only joyful moments but also a century of tragic events, presents itself to the visitors in its full splendor. Where Is The Danube River?